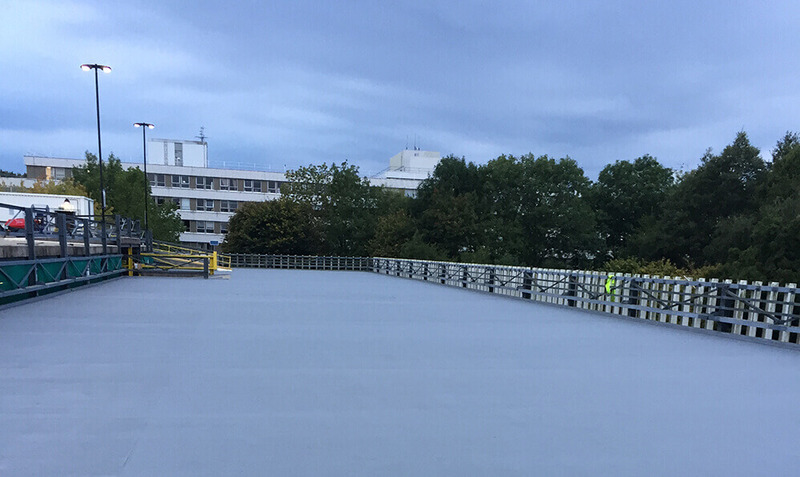 Flowstone Industrial Flooring Limited were pleased to be re-appointed to carry out the liquid applied coatings and waterproofing works to the multi storey car park at Warwick University, during a planned 5-week programme. As well as completely re-waterproofing the entire top parking decks & ramps, works also comprise protective coatings to the soffits below, re-painting of steelwork and re-detailing of the drainage system. Flowstone had previously carried out similar works to another area of the car park and were delighted to be selected again. Car Park 15 had previously received a protective waterproofing system which was now reaching the end of its life. Refurbishment works were due in order to ensure sufficient protection of the car park structure, from water ingress and fuels and oils. Tremco’s fast curing MMA car park coating and waterproofing system was specified for the purpose. The system was to be fully-reinforced with fleece banding. The existing sealant had reached the end of its productive life and was not providing a secure base for the waterproofing system and required to be removed in order to ensure secure waterproof detailing further to replacing it with MMA elastomer that was compatible with the deck waterproofing system. Flowstone team proceeded by removing the mesh and raking out the existing sealant which was then mechanically prepared and cleaned using Blastrac at the same time as the rest of the existing deck. Minor concrete plinth repairs and making good of asphalt were carried out and anti-carbonation coating was applied. Both deck and rebate were then primed with CP150 concrete primer. Joints were filled flush with surface with CP360 Waterproof Membrane and then banded with CP360 / CP581 as per specification. Flowstone then continued to install MMA waterproofing system according to manufacturer’s specification, finishing with the application of DVSA markings. The Client was pleased with the quality of work and ability to work within varied weather conditions to complete the project on time, and is looking forward to continuing their collaboration with Flowstone Industrial Flooring Limited for more future car park projects.